This image, shot by photographer Ding Zuhe and called, “Monk’s Posture,” won first prize in the China category for National Geographic’s 2017 photography contest. Here are six people, all in some form of sleep, lethargy, stupor, or unconsciousness. There are two women (the one in the foreground looks older), and four males: a child in the foreground, a teen or young adult to the far left, and a young man plus a slightly older one in the right corner. Ding leaves open to interpretation how they feel; for all we know they might be comfortable. However, it doesn’t look like as if they are. Then we have the monk: sitting in a classical Zen posture, his head slightly bowed, cross-legged, dignified, a noble contrast to the six sloppy engines of flesh splayed out around him. The photo sparked discussion on the Chinese web, with some netizens marvelling that in an age where religious values and spiritual authenticity have been displaced by mainstream materialism and cultural chaos and alienation, the power of religion remains leagues above what its worldly counterpart can offer. At a shallow level, it might be speaking of the sloppiness of laypeople juxtaposed with monastic discipline and purity, although this is rather lazy to me. It’s easy and common to castigate the laity as too distracted or uncaring to tend to religious matters when in reality some of the most devoted and wise Buddhist practitioners are householders. I’d like to offer a different interpretation. 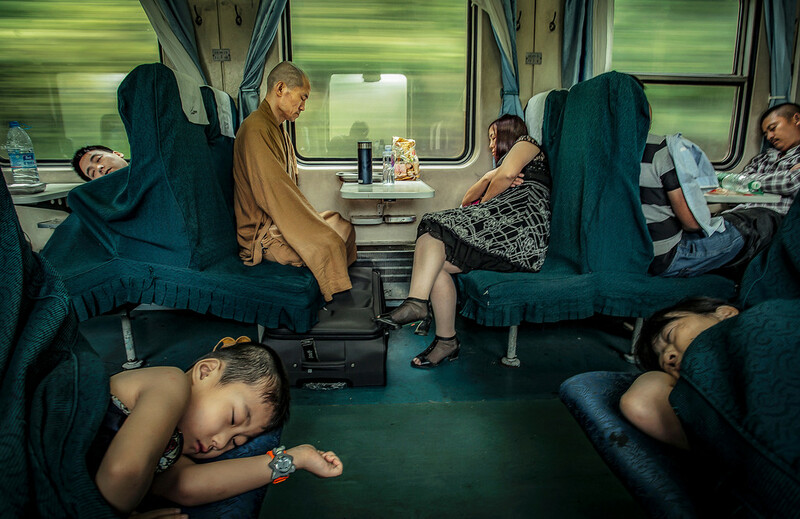 This photo is not about external appearances or even the contrast between the monk’s meditative dignity and the passengers’ outward sloppiness. This is a snapshot of the human interior. The monk is the Buddha Nature that is always present in every train, every engine of flesh that hurtles towards death. There is no alternative but to crash and burn, eventually, no matter how happy or fulfilled one’s life has been. Most of our interior being is asleep. Our inner selves have been like this train cabin for generations; our alienation with ourselves and each other cuts across gender, class, and age. Yet is the monk himself meditating, or actually asleep too? If he is asleep, he might represent the germination of awakening that brings the members of the cabin to true life. There is also the theme of exhaustion. Comfortable or not, everyone in the photo, except perhaps the monk, look totally shattered, knackered beyond expression. Is this the gradual wearing down we all experience in the experience of samsara, which really just amounts to a terribly, awfully long journey over billions of lives and eons? When and how will the monastic wake them up from their slumber? When can we get off this train?